Sounds fun already! Doesn’t it? 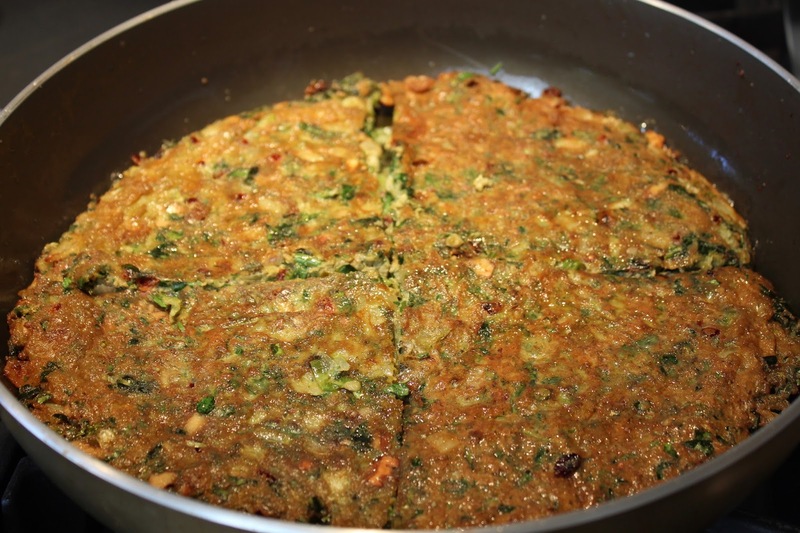 Simply translated as ‘pancake or frittata of herbs’, not only is kookoo sabzee a fun dish to make, eat, and say, it is also delicious, healthy and nutritious. Fresh herbs, eggs, and spices are the perfect vegetarian combination of protein and greens. Very similar to kookoo sibzamini (which is a frittata of potatoes, similar to latkes), this version has deep earthy herb flavors complimented with walnuts and a pop of berries. 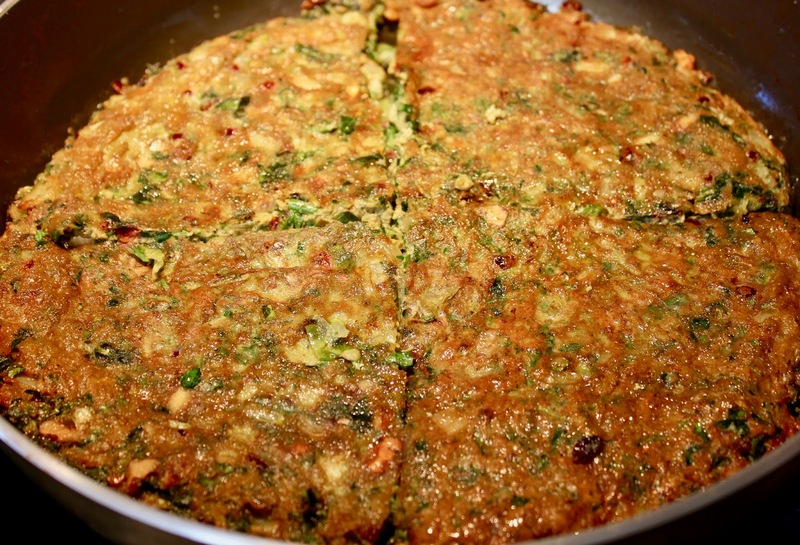 Traditionally prepared very similar to a pancake (as it needs to be carefully flipped over), this delicious and nutritious combination of herbs, berries and nuts renders a complete satisfying healthy meal. Kookoo sabzi can be enjoyed hot or packed as a sandwich to enjoy throughout the week. 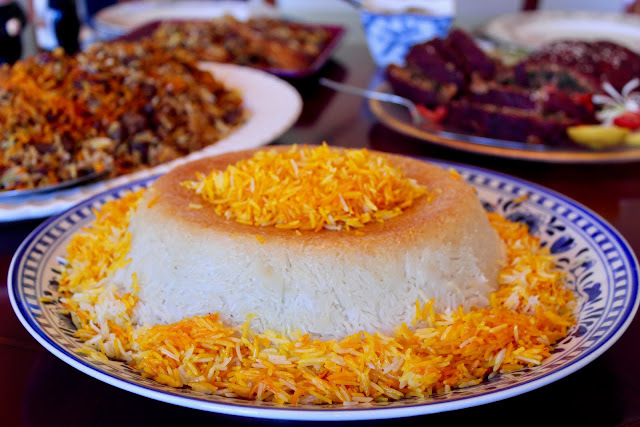 Traditionally served with sabzi polo and fish for Persian New Year, kookoo sabzi can be enjoyed all year long as a healthy meal. While the kookoo is hot, I like to make a sandwich using toasted pita bread. I generously stuff my pita bread with slices of frittata and add fresh herbs, salad, or pickled vegetables. 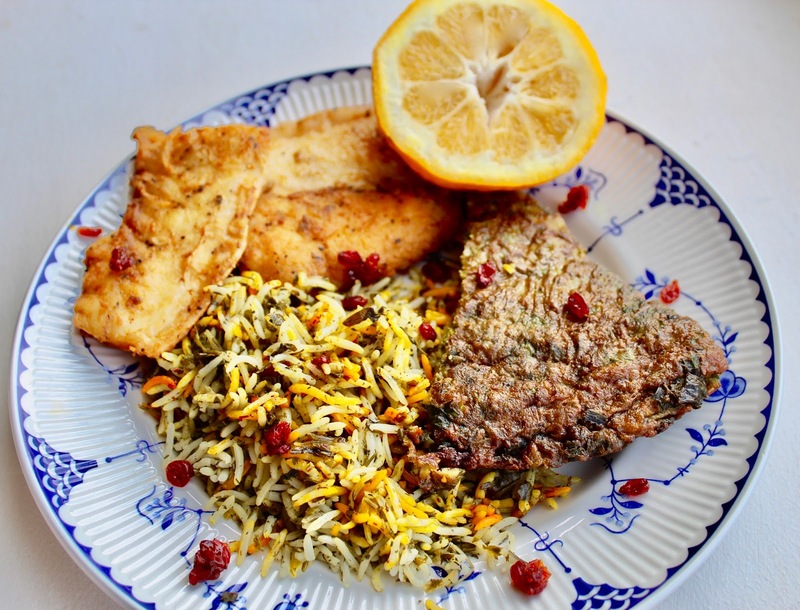 Or simply enjoy bites of kookoo with bread (I recommend lavash, pita, or sangak) with a side of salad. 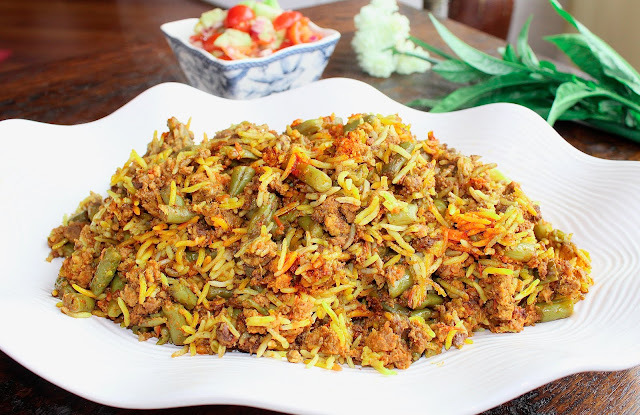 Trust me, there is nothing kookoo about this dish! 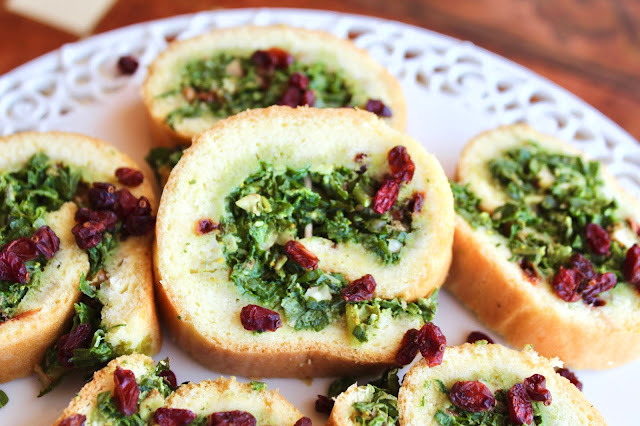 Have fun making and eating kookoo sabzi. The herb ingredients do not have to be exact; feel free to add any other herb you like and play around with the measurements to suit your taste buds. 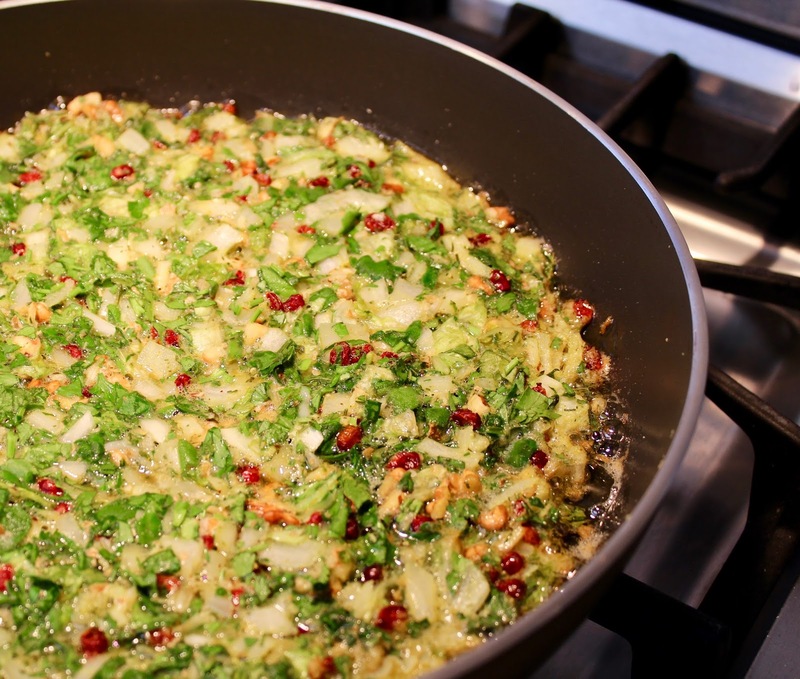 Using a food processor individually chop parsley, green onions, lettuce, and yellow onion- making certain to not over chop to exude the herb’s natural juices and create a watery mush. Using a large mixing bowl, add the chopped herbs, fenugreek, dill salt, pepper, turmeric, and eggs and whip with a large spoon for a good minute to blend all ingredients and well incorporate the eggs . Using a medium sized frying pan (10-12 inches) with a lid, warm oil over medium heat. Once the oil has become hot, fold in saffron, walnuts and berries into mix. Very carefully, add herb mix to oil and spread the mixture evenly to cover the entire surface area of the pan. Be careful that the liquid from the mix hitting the hot oil does not splatter and cause serious burns. 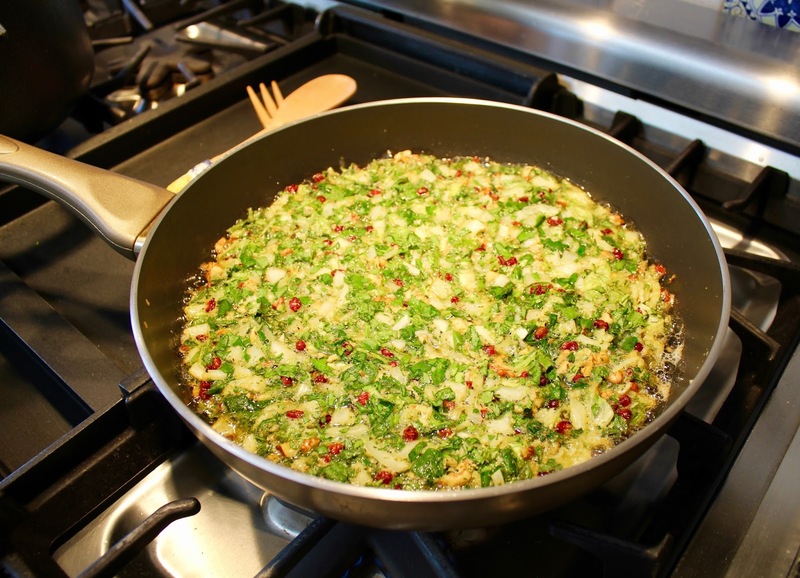 Place the lid onto the pan and cook for five minutes on medium heat and then lower temperature to low and cook for another fifteen minutes. 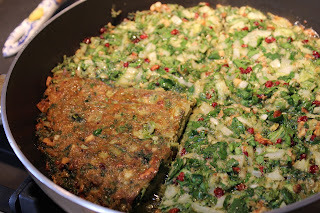 Once the outside edges become golden brown, it is time to flip kookoo sabzi over to cook top side. 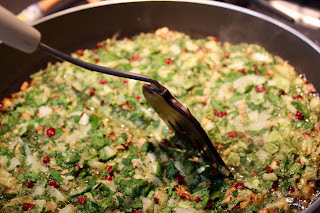 Using a wide flat spatula, cut and divide the kookoo sabzi as you would to cut a pie into 4 equal size shares. Make certain spatula makes contact with bottom of pan to completely separate thoroughly 4 equally parts. Flip one quarter at a time. Until all four quarters are flipped over. Leave lid off and cook for additional 20 minutes over medium low heat. Serve immediately while hot; or pack a great sandwich for the following day.